It seems to me that when the month of February comes around each year there is a change in our behaviors. There is a spike in flower and chocolate sales, it is difficult to get a reservation at your favorite restaurants, and jewelry salesmen have a smile beaming from their faces because of the increase in sales. Valentine’s Day is a holiday that elicits some pretty powerful emotions by a wide variety of people—some thinking that it is one of the greatest days of the year while some think that it is simply a fake holiday created by Hallmark. Regardless of your feelings about the day or the change in our habits, at the very least, February gets us all thinking about how we love one another. I’ve been doing a lot of thinking about the topic of love lately, and much of it has come out in our latest message series from Romans. We’ve been reminded of the great love that God has for us and His desire for relationship with us. We’ve learned that at the very core of God’s love for us must be a genuine love for our brothers and sisters. We’ve examined how we show love to each other and the importance of it. But, one thing that we haven’t addressed is the intended response of those who are not yet a part of Christ’s Kingdom. I’m encouraged again that the answer to this question has already been given to us and isn’t dependent upon my conclusions. 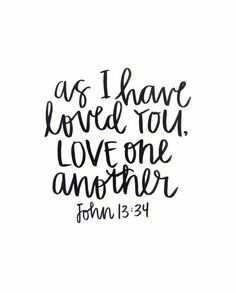 Jesus tells us in John 13:34-35 that there’s a solid reason for people seeing believers love one another. Jesus puts it like this: “A new commandment I give to you, that you love one another: just as I have loved you, you also are to love another. By this all people will know that you are my disciples, if you have love for one another.” The message that Jesus gave in that upper room is clear to us—our love for one another is intended not only to strengthen the church, but it is to be an effective way of showing God’s love to people who are not yet believers! It is our mission. It is our calling. We are to be a church characterized by love. As I’ve been thinking about my own life and how I show the love of Christ to others through my love for the church, there are a couple of areas where we need to be challenged in how we show love. Choose to Show Love—there’s always that one person that we just can’t seem to get along with or just can’t stand to be around. Loving people is sometimes difficult. That’s why God reminds us that it is a choice that we need to make because He chose to love us. Even though they might be tough to love, we need to choose to love with a genuine love. Be Genuine in Your Love—there are times when we try to love people, but really aren’t being loving or try to put on the mask of love when our intentions are otherwise. The world knows the difference. They know when we’re being fake with one another. While this list isn’t a complete one, I do believe that it will help you in examining whether or not the world truly believes that we love one another.